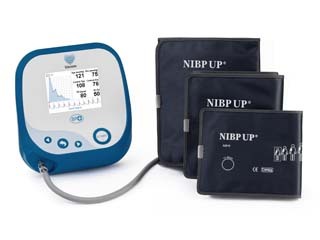 The new Uscom BP+™ technology provides simple to use yet highly accurate & repeatable measurement of Central Blood Pressure and Augmentation Index / Arterial stiffness and other haemodynamic parameters. Uscom BP+™ technology measures both Brachial (Systolic and Diastolic) & Central Blood Pressure (Systolic and Diastolic) waveform parameters quickly, consistently and simply using a familiar upper arm cuff without the need for additional training or sensors and also provides pulse rate variability and signal quality indices. The Uscom BP+™ has been validated against invasive measurements of Central Blood Pressure as well as non-invasive measurements obtained from radial artery tonometry. The Uscom BP+™ is not operator dependent and provides highly accurate and repeatable measurements within 60 seconds using a simple oscillometric BP cuff. Press the Start Button to get results in 80 seconds. Uscom BP+™ technology, the ultimate "Central Blood Pressure & Arterial Stiffness Machine" measures the blood pressure in the arm (Brachial Blood Pressure) and at the heart (Central Blood Pressure) in one simple step. Measuring the arterial stiffness, enables you to identify and treat cardiovascular disease before it strikes. With high clinical accuracy, it non-invasively provides measurements by using a simple osscillometric Blood Pressure cuff that previously required invasive methods. It is easy to use, repeatable, accurate and fast. It gives you a value-added tool to help patients raise health consciousness and take effective action. It creates a low-maintenance and highly-profitable revenue source. The device is affordable and generally pays for itself within 1-3 months. Advancements in technology now allow for a single cuff design which is easy to operate!